Welcome to Riverbend, Ohio’s premium labradoodle breeder. 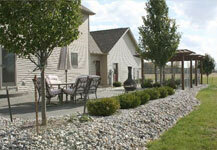 We are located in the beautiful countryside of Northwest Ohio, in the heart of the historic Black Swamp Region. We designed and built our homestead around our love for our animals. Our home is designed for our puppies to live with us, so we can provide a loving, healthy environment, to build the foundation that will help them grow to their full potential. Paying attention to how a puppy grows, from the day he is born, is important for the very health and vitality of each puppy. And, we believe that the first eight weeks of a puppy’s life, is of vital importance in determining his later behavior as an adult. Our puppies are handled constantly, and exposed to our everyday life, and everyday noises to create a positive social experience that will enable them to become wonderful lifelong companions. 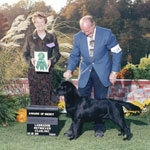 We started breeding top-quality, all-purpose English Style Labrador Retrievers in 1988, under the ‘Lakeview’ prefix. For nearly 20 years, we built a strong foundation with sound genetics, impeccable health, and a solid reputation. 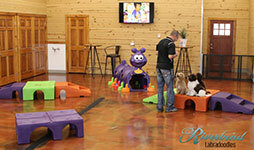 Our dogs have been titled in conformation, obedience, agility, and in the field. 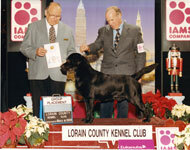 We bred and owned the #4 Labrador Retriever in the United States in 2000, AM/CAN Champion Lakeview’s Pistol Pete JH. ‘Pizza-Man’ attended the prestigious Westminster Kennel Club Show at Madison Square Gardens in New York City two years in a row. We are also proud of our relationship with Service Dog Organizations. From puppy donations, to working closely with their individual breeding programs, we graduated many Service Dogs through Paws With A Cause, an assistance dog organization, and Leader Dogs For The Blind. Our Labradors, and now our Labradoodles will continue to help people with disabilities regain their independence through these phenomenal organizations. In 2003, we were introduced to the Labradoodle Breed and found everything we loved about our Labradors, minus the things we didn’t. The Labradoodles have high intelligence, a sweet disposition, willingness to please, and make perfect family companions. Their coats are wonderful and are easy to care for, and lack the excessive shedding, smell, dander, and oil of the Labrador Retriever. breed the best Labradoodles possible. 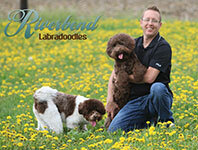 We have made it our focus to protect the health and future while maintaining the integrity of the Labradoodle Breed. Our carefully planned breeding program is dedicated to quality, not quantity. 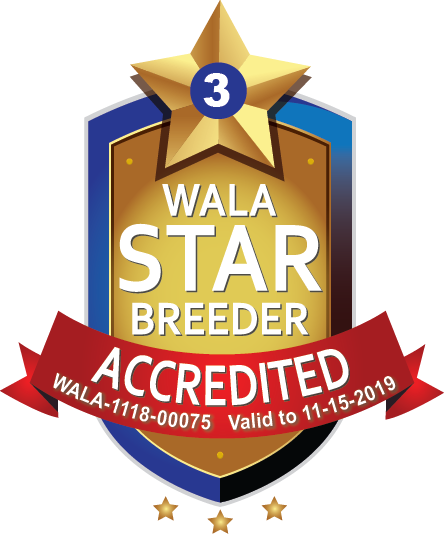 We believe it is of utmost importance to have OFA hip, OFA elbow, ACVO eye clearances, and also breed specific health clearances, as well as Champion Quality pedigrees within all of our dogs’ bloodlines, to ensure we have the healthiest puppies possible. The breeding Labradoodles are sound, healthy, intelligent, playful, and maintain the look of the English Style we love. They are stocky, and larger-boned than most Labradoodles, and have a beautiful, blocky head that gives them a soft, intuitive expression. They are laid-back, easy-going, quiet and intuitive. They are wonderful family companions, intelligent and easy to train. They also love the water, are natural retrievers, and love fun and clever games. Shortly after construction of our home was complete, we designed a patio for ourselves and our companions. Mom’s have a shaded, quiet patio to relax, during short periods of rest, away from their puppies. We all have a beautiful view of the countryside around us, and can spend quality time together. We also enjoy the expansive lawn around us, where the puppies have constructive playtime, and can romp and roam under our careful supervision and guidance. We have recently expanded our services with the addition of a beautiful new building to be able to offer high quality grooming for our Riverbend Guardian Families, and fun playtimes and training sessions for our growing puppies. Here at Riverbend, our years of breeding, training, and caring for dogs and puppies of all ages and sizes, comes a lifelong journey that we will gladly share with families near and far. We offer a lifetime of support, and look forward to pictures and updates from our Riverbend Families. 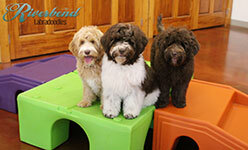 We love sharing our Labradoodles with others,and welcome any and all questions concerning them. 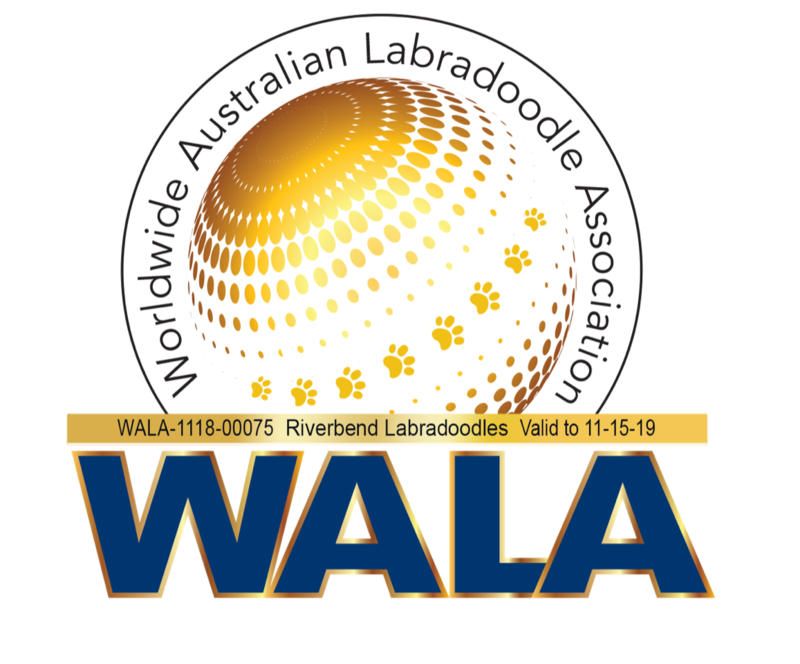 We are also blessed to be involved with two fantastic Labradoodle Breed organizations, WALA is the Worldwide Australian Labradoodle Association and the ALAA is the Australian Labradoodle Association of America. Both are worldwide organizations dedicated to protecting the breed we love so much. They maintain databases recording the Australian Labradoodles and Labradoodles of the world. They also share our special commitment to health testing and supporting responsible breeding practices. We are proud of our participation as Board Members of the ALAA, as well as being Founding Members of WALA. We are honored at the opportunity to help protect and promote the breed we love so much, and connect with a membership that shares the same love and dedication to our breed. 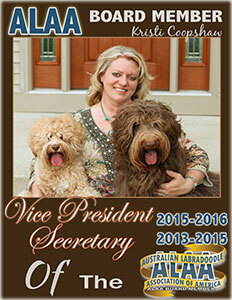 We are proud to be an Ohio Labradoodle Breeder of quality, authentic Australian Labradoodles. Riverbend Labradoodle families can be found in almost every State, and we welcome visits or are happy to provide references. Our centralized location is convenient to many Midwest families, and we are within a few hours driving distance from many major cities in Ohio, Indiana, Michigan, Illinois, Missouri, Wisconsin, Minnesota, Kentucky, Tennessee, West Virginia, Pennsylvania, and New York. We are experienced in sending our Australian Labradoodle Puppies via air to Western states including California, Oregon, Washington, Idaho, Wyoming, Colorado, Kansas, Nevada, Arizona, and New Mexico, Southern States including Florida, Georgia, North Carolina, South Carolina, Alabama, Louisiana and Texas, and New England States such as Maine, New Hampshire, Massachusetts, Connecticut, Rhode Island, New Jersey, Maryland, Delaware, and Virginia. We have also sent our Australian Labradoodle Puppies via air to Canada and Mexico.